Positioned 19 kilometres south of central Central Coast, Umina Beach is a great neighbourhood to see when travelling through the area. Packed with industrial machinery, boats and piles of multicoloured containers, Ettalong Wharf is hard to miss. 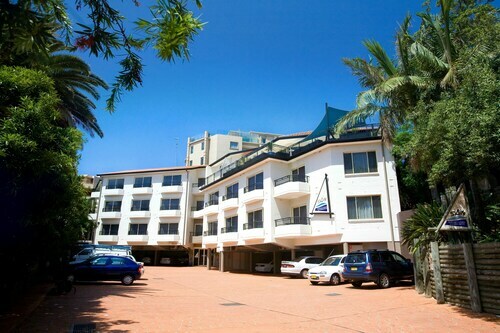 Book a room at the Mantra Ettalong Beach and Ettalong Beach Tourist Resort to stay nearby. Whether you're in the mood for training or just chilling out, Umina Recreation Centre is a fantastic place to stop by. For this spot, take a look at the Ocean Beach Resort & Holiday Park and Beachview Homestay. Feeling peckish after walking around Umina Beach? Sit yourself down in a cozy corner at 304 On West. This well-recommended eatery provides all the caffeinated beverages and tempting snacks that a worn-our traveller could ask for. There's no better way to get to know a place than by having a few cold ones at the neighbourhood bar. After a long day of adventures, pull up a stool at Ettalong Diggers where the drinks flow till late. If you and your travelling companion can't find the ideal Umina Beach hotel deal, it's worth checking out the accommodation options in Killcare Heights and Woy Woy. Wotif will help you make it happen, from hotels and flights to car hire and activities, when it's time to stop dreaming and start experiencing. How Much is a Hotel Room in Umina Beach? Hotels in Umina Beach start at AU$107 per night. Prices and availability subject to change. Additional terms may apply.